Sevilla community in St. Augustine, Florida. Sevilla is a new residential community offering casually sophisticated living in northern St. Johns County. Sevilla offers a stunning selection of single-family homes perfect for homebuyers in all stages of life. Community builders are Ryland Homes, Mattamy Homes and D.R. Horton. Sevilla features a community clubhouse, aquatics facility with children's water park, sun deck, picnic tables, children�s playground and a basketball court. Located just minutes from historic St. Augustine, Sevilla is quickly emerging as the area�s hottest address where residents can enjoy value-rich homes surrounded by a wealth of natural beauty. 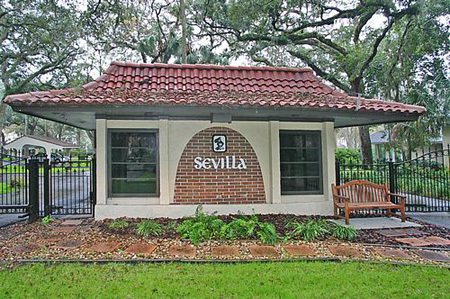 Nestled within the World Commerce Center, Sevilla also is conveniently less than one mile to major thoroughfare I-95. Golf enthusiasts can enjoy play at several local courses, such as: St. Johns Golf and Country Club, South Hampton golf community and Cimarron. Sevilla residents also can enjoy the many venues of World Golf Village, as well as larger-than-life movie screenings at IMAX Theater. Ideally located close to historic St. Augustine and minutes to Downtown Jacksonville, Sevilla is nearby to many renowned concert and sports venues; upscale regional, outlet and boutique shopping; fine and casual dining; eclectic art galleries; antique shops; the beach and much more. It also is located in the county�s highly rated school district including Mill Creek Elementary, Pacetti Middle School and Nease High School.